The other day I received in the mail the following book: N.P. 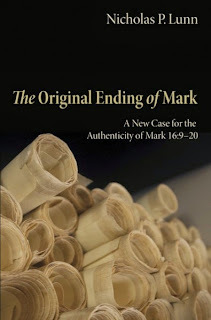 Lunn, The Original Ending of Mark: A New Case for the Authenticity of Mark 16:9-20 (Eugene, OR: Pickwick, 2014). The title is straightforward. It tells you exactly what the book is about. I like that. It is an advocacy book - everything is slanted to persuade you that 16.9-20 is the original ending of Mark. The book is big enough. Sometimes you get books and you can tell in an instant that even the author hasn’t taken the subject sufficiently seriously - the book is too small. But here we get a large size book (i.e. large pages) and with 378 pages. Big enough to mount the necessary argument (without being an NT Wright sized over-production). The layout is pleasing. Obviously Wipf and Stock must be doing something right at the moment. The paper, font, page layout etc. is just simple, clear and the sort of book an author could be proud of. The price is right. Obviously I got my print copy for free (although I did pay for my Kindle copy). In exchange for a critical review. But the price for this book is listed as US $34.40. If Wipf and Stock are going to be doing textual criticism then we are going to have a very marketable outlet for good scholarship and affordable prices. But one shouldn’t only judge a book by its cover. Interesting. I'm writing my review of it for ABR. Amazon tells me there is another book supporting the long ending from Wipf & Stock. David Hester, Does Mark 16:9-20 Belong in the New Testament? Anyone seen it? http://preachersstudyblog.com/wp-content/uploads/2009/12/IS-MARK-16-9-20-PART-OF-THE-MARCAN-AUTOGRAPH.pdf . The book is at http://www.amazon.com/Does-Mark-16-Belong-Testament/dp/149820158X . A brief investigation of the preview indicates that Hester's view -- when he wrote the book -- is that Mark didn't finish, and the draft was unofficially disseminated, and then he finished it, and it was disseminated. So, basically a two-edition theory, with the second edition (with 16:9-20) being the authorially approved edition. Or something to that effect. Are you referring to Richard Carrier, the atheist who denies that Jesus existed? And who claimed that he had been studying New Testament textual criticism for seven years, but was still unfamiliar with how to differentiate identification-numbers of uncials and minuscules when he initially wrote the referred-to paper? Reverend Snapp, I have to confess that I think you are the foremost defender of 16:9-20 the world has ever known. I originally offered the job of 16:8 original to Professor Ehrman but he declined complaining that it had already been done repeatedly by Mainstream scholarship. Dr. Carrier: Reverend Snapp, do you agree that the author of GMark 1-16:8 did not write GMark 16:9-20 with the intent that it be the conclusion of GMark 1-16:8? Dr. Carrier: No further questions your honor. The defense of 16:8 rests. You would be perfectly within your rights to have that court hearing. In fact, I frequently tell James that this is the result of his theory and conjectures, in our discussions on the Facebook forums. (I did see the CARM 2010 debate and I reference that historical event.) We have actually had some fascinating tussles on this point. Thus, I contrast his position with that of John William Burgon, Professor Maurice Robinson and other full supporters of the traditional ending who say .. full Gospel written by Mark, published by Mark. Much as James might like this not to be emphasized, and please understand that I am not speaking for Maurice Robinson, only working off some "talking points", I have a responsibility to share that the real battleground is involves full authenticity. Does it make an exegetical difference when one views Mk. 16:9-20 as a Markan composition that was added to the text in production to finish the main account which Mark had unintentionally left unfinished? Yes. Does this make the passage non-original? No, because when dissemination of the Gospel of Mark began, the text included these 12 verses. They did not originate as a bizarre pastiche in the 100's. If you start with the idea that a section was added from a floating pericope or "friends of Mark" (and those are themselves special pleading guesses of who would have done this work) there is no basis to claim that the twelve verses were added before the convenient claim of being before the "production stage." E.g. two editions is surely just as possible, in this scenario. How could you tell if a change was made a year before or a year after the "production-stage" point. Overall, it is hard to time an event, the tack-on, with no historical basis. Not only is there no evidence the event occurred, if it had occurred it could be any time from 45 AD (I will easily defend Mark as written before 45 AD, Luke at 41 AD to Theophilus) to after 100 AD. And it could be done by just about anybody, using any material from anywhere. As long as it was early enough to infiltrate to Justin Martyr and Irenaeus. The Wallack-Carrier court case would say that if the ending does not fit, authenticity you can not acquit. They would see your case as simply a variation of the Metzger "non-Markan but scripture anyway" attempt. Granted, you seem to have toned down "friends of Mark" in order to lessen the obvious difficulties. And I want to emphasize that the idea that the ending was not pure Mark never even remotely was considered, by myself and many others.It came out of left field. Then came the arguments of Hort and others, which never made any sense. All the style type arguments have been long rebutted. A while back, we went over your seven reasons for your theory, and to me they fell flat. I've never understood why such a difficult approach to the beautiful Bible text is taken. (This next is ad hominem to your position) All ideas that Mark was interrupted, just at the end, jail, death, migraine, with no historical note, rather than his actual ending lost are ultra-special pleading. They are essentially faith-based rather than logical, and the real faith-consistent position is full Markan authorship. You just are concerned that if an ending was lost, your claim of authenticity would fall flat. So let us try interruption. Then we have not lost an ending. So the bulls-eye of the target scenario is moved around to match the arrows previously sent forth. I like the footnotes in the part about external evidence! Lunn seems to overlook the obvious objection to assigning knowledge of Mk. 16:9-20 to a couple of early second century writers: it's not sufficient to show that a writer was familiar with the material; what's needed is to show that it was known as part of the Gospel of Mark. It is rare in the second century for any Christian writer to name the New Testament book he is citing. Yet Irenaeus (c. AD 185) does do this with his citation from the longer ending of Mark, attributing it specifically to Mark. Lunn makes this clear in his book (pages 82-83). This aside, it is the internal evidence that identifies the author of the longer ending with that of the second Gospel. "It is an advocacy book - everything is slanted to persuade you that 16.9-20 is the original ending of Mark." We know that Metzger and Wallace write about this section in advocacy manner. e.g. The reader would not have the remotest idea that 99.9% of the Greek, Latin and Syriac mss support the traditional ending with the resurrection appearances of the Lord Jesus against the abbreviated woman afraid ending. Nor would they have the faintest idea that the ECW have numerous Ante-Nicene references. Nor would they know that supporters of the abbreviated ending often take the position that preservation of Mark's Gospel was an unhappenning .. ie. the inspired ending was lost. In fact, the traditional TC approach is "All Advocacy All the Time". Designed to hide the basics. Sometimes, however, balanced truth is de facto advocacy. Did Lunn omit important arguments contra the traditional ending? That would be the important element of considering it an advocacy book, in the sense of bias. I'm writing a review of Lunn's book at http://earlywritings.com/forum/viewtopic.php?f=3&t=1701 . I've only looked at the Introduction so far and Lunn's objectives and methodology are not clearly or professionally organized. His conclusions here are often not supported by the evidence he refers to or are even contradicted by it. He does have a lot of detail in what follows his Introduction so his arguments may be better there. He mistakenly claims that the key to the Against LE argument is S & V when it is actually the Internal evidence. Regarding the External evidence, E and J's Textual Criticism evidence is much more important than S and V so I'm curious to see how he defends against it. Joe, here is a simple historical consideration. If Vaticanus and Sinaiticus had not been missing (in their quirky way) the Mark ending, there never would have been an issue in 1881, or today. The abbreviated text would barely be an apparatus entry, and would be in zero Greek New Testament editions. If the subjective realm of "internal evidences" were very different, Westcott and Hort almost surely would have omitted the ending. No matter what the "internal evidences" evaluation. The Critical Text started out as a Vaticanus-primacy text (putting aside western non-interpolations) and for the most part remains so today. All Reformation Bible, Vulgate, Peshitta, and Byzantine and Western editions will have the ultra-majority text. Even an Alexandrian edition would have to puzzle out the split, since most Alexandrian mss have the traditional ending. Only a Vaticanus-primacy (or the quirky one edition of Tischendorf with was Sinaiticus-oriented) text will omit the ending. Remember, 99.9% of the Greek, Latin and Syriac mss support the ending, which would make for a very high bar of internal evidence needed, which is not even remotely approached. The key has always been Vaticanus. In point of fact, internal evidences in the modern realm are often special pleading to match the preexisting Vaticanus-primacy variant. Historically, your criticism of Lunn on this issue is simply false.